The Uber Freight Plus fuel card provides up to 20 cents off per gallon at TA/Petro fuel stations for users, who also will receive maintenance and phone discounts in the program. Just one year after launching its freight matching app, Uber Freight has made strides to improve its functionality and ease of use. First came load recommendations and then a feature called “Take Me Home.” Now, the company is at it again, only this time, the updates will provide significant value in terms of cold hard cash to users. The company is launching Uber Freight Plus, which features a fuel card, maintenance and truck discounts, and even phone plan discounts. “We realized it’s not just about how much you are paid, but how much you spend,” Eric Berdinis, senior product manager, explains to FreightWaves. Uber Freight Plus participants receive up to 20 cents per gallon discount off the retail price of fuel through the use of the Uber Freight Fuel Card powered by Comdata. According to the company, a typical discount for an owner-operator may be 8 cents off per gallon. The discount is available at TA/Petro Travel Stops nationwide. A smaller discount of 15 cents is available at Roadys – a collection of independent truck stops in California, Texas and Illinois. The fuel card will include some additional benefits such as tracking IFTA and fuel reporting, Berdinis says. The fuel card also provides access to maintenance discounts and 30% off Goodyear tires, resulting in an average of $130 off per tire, says Julia Zaga, business development senior associate for Uber Freight. 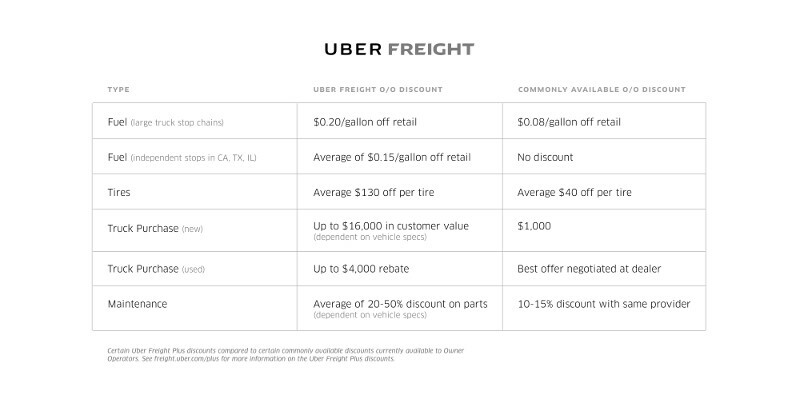 Compared to “commonly available” discounts for owner-operators, that’s a $90 additional benefit, Uber Freight says. In addition to the fuel discounts, the company has also struck a deal with Navistar to offer between 20% and 50% off truck maintenance – a huge expense for many small fleets and owner-operators. The discount applies to all Navistar parts, including its all-makes line of parts, Zaga says. The size of the exact discount varies based on fleet size and maintenance needs. Uber Freight provided a look at the discounts available through its Uber Freight Plus program and those commonly available to owner-operators. Navistar is also providing Uber Freight Plus members savings on new and used trucks, with up to $16,000 in customer value for the purchase of a new truck (value depends on specs), and up to $4,000 rebate on the purchase of a used truck. “An owner-operator really doesn’t have much buying power, so they may only see $1,000 off, but we’re offering up to $16,000,” Zaga notes. The discount on new trucks applies only to International models, however the rebate on used trucks can be applied to any brand as long as the vehicle is acquired through Navistar’s network. Finally, members will receive discounts on monthly phone plans and accessories through Sprint. Zaga says this discount applies only to phone plans at the moment and not data, but that data could be added in the future. One of the perks of the program, Berdinis explains, is the ease of participating. To be eligible, a driver must only haul one Uber Freight load per month. It also applies to a fleet, so if a small trucking company with 10 trucks participates, only one load must be hauled per month and every driver in the company would benefit. There are special restrictions around the new truck plan, however, even those are easy to meet. The new truck discount does not become active until you have hauled 10 Uber Freight loads, but the discount can be used on as many trucks as you wish once you fulfill the 10 load requirement.